For the 10th year in a row Formula Drift returned to Road Atlanta to the delight of thousands of fans who found a grassy spot to kick back and watch all the sideways action. The weekend started off with rain during qualifying. However, if you know anything about drifting you know that rain won’t stop it from happening, in fact it only makes things better because it really separates the good drivers from the not so good. Although, Formula Drift officials still wanted the drivers to be sure they could run safely so they were allowed one “test lap” before their judged run. Despite the rain and super slippery track it was privateer Forrest Wang who won the top qualifying spot and Tyler McQuarrie grabbing the second spot. On Saturday the weather cleared up and the asphalt was ripe for battle. There were some pretty big shockers a long the way as well such as 2013 Champion Michael Essa being taken out in the Top 32 by Odi Bakchis and Daigo Saito not advancing past the great 8 due to mechanical issues. 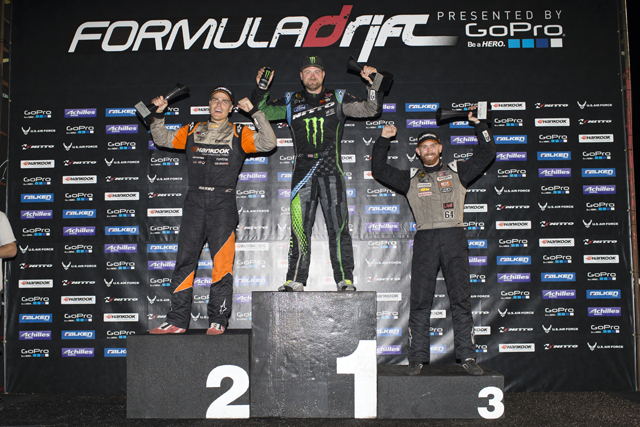 The four standouts of the round were Fredric Aasbo, Chris Forsberg, Robbie Nishida, and of course Vaughn Gittin Jr. All of those drivers charged through their competition until it came down to the finals. Aasbo defeated Forsberg and Gittin took down Nishida which lead to a re-match of sorts between Gittin and Aasbo. These two have a history…of running over each other. Although this time no such contact was made and Vaughn Gittin Jr. took the overall win. Chris Forsberg’s 5th place qualifying spot earned him his second podium in a row which kept him on top of the points battle with a nice cushion between him and Vaughn Gittin Jr. You can check out the points standing below. The next round will be at the end of the month in Miami so stay tuned!